Promoters of the ultra-right People’s Party Our Slovakia (Ľudová strana Naše Slovensko – LSNS) are planning an event on 29 September to “clean up” the Romani settlement in Krásná Hôrka. The party is inviting people to attend the event through social networks and its website, which claims more than 300 people might participate. The party has also published the text of a document in which its leading candidate, Marián Kotleba, asks to coordinate the event with the Slovak State Police. Kotleba was recently gifted land below the Krásná Hôrka castle on which several illegally built dwellings are currently located. “After arriving at the parcel of land concerned, we discovered there is a great deal of solid municipal waste on it, as well as several shanties without numerical addresses. There were also a number of people unknown to me there who are probably squatters. They gathered around and after we told them the waste would be cleared away from my land within the next few weeks, they began to be unsatisfied, some of them even aggressively so,” Kotleba wrote in his request for police officers to be present during the event. Kotleba announced his intention to raze the illegal Romani dwellings on his land shortly after acquiring it. At the time, Romani residents made no secret of the fact that they are prepared to use violence to defend their constructions. “If Kotleba comes here to provoke us, we cannot guarantee what state he will leave in,” Romani people from Krásnohorské Podhradie were quoted as saying in May. After a fire destroyed the local castle on 10 March, Kotleba said the local Romani community was responsible for damaging a national cultural monument. Kotleba was gifted an 800-square-meter parcel of land on which three or four illegally built dwellings now stand. He agreed to the transfer of ownership with the previous owner of the land, who is a village resident. According to the Slovak media, Kotleba wants to get rid of the illegal constructions erected by local residents and developed the plan after the 10 March destruction of the local castle by fire, an incident allegedly caused by two Romani children. Mayor Peter Boll insists that prior to the fire, village residents had never had any problems with local Romani people and there had been a minimum of crime in the area. He is concerned that problems might start over Kotleba, who made a failed bid for parliament last year on the LSNS ticket. Boll said the village was unable to intervene against the transfer of the real estate. Around 900 people live in the local settlement. 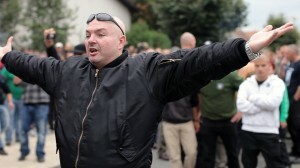 Kotleba was previously the leader of the Slovak right-wing extremist party and fascist association called “Slovak Solidarity” (Slovenská pospolitost – SP). The association espouses the legacy of the WWII-era Slovak state, which was an ally of Nazi Germany. The group first organized as a political party, but the courts banned it. Members of the community then registered the group as a civic association. In a report dated 12 November 2008, the Slovak Interior Ministry said the SP was being dissolved for inciting nationalist and racial intolerance and hatred, which contravenes the Slovak Constitution and laws. The SP is infamous for its marches “for the nation” and against Romani people. Its members use the fascist greeting “Na stráž” (“On duty!”) and wear clothing reminiscent of the uniforms of the Hlinka Guard, a paramilitary organization that persecuted Jewish and Romani people in Slovakia during WWII.